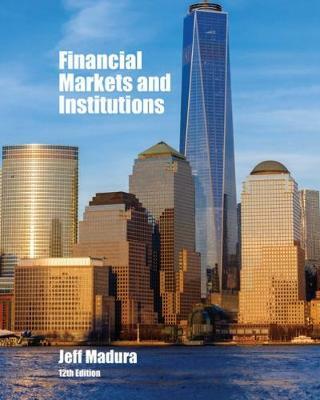 Packed with timely examples and practical applications, Madura's best-selling FINANCIAL MARKETS AND INSTITUTIONS, 12E, equips you with a clear understanding of why financial markets exist, how financial institutions serve these markets, and what services those institutions offer. Focusing on the management, performance, and regulatory aspects of financial institutions, the text explores the functions of the Federal Reserve System, the major debt and equity security markets, and the derivative security markets. It also reflects the latest developments from the field -- including updates on regulatory reform. Helping you maximize your course success, MindTap Finance digital learning solution enables you to connect with your instructor, organize coursework, and access a range of study tools -- including an e-book, pre-populated flashcards, quizzes, and more. Financial Markets and Institutions is available with MindTap, an integrated etext and online learning solution that enhances understanding of course content and offers opportunities to extend learning.